The Four Horsemen of the Apocalypse, Turin Beatus Codex, Beatus of Liébana, Spain. 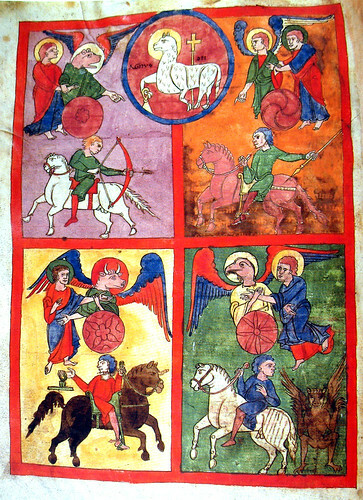 A larger image of 'The Four Horsemen of the Apocalypse', Turin Beatus Codex, Beatus of Liébana, Spain. First Four Seals: Four Horsemen. From the Turin Beatus, early 12th century. Christ, the Lamb is in the circle at the top; the four evangelists: upper left, Mark (lion); upper right, Matthew (man); lower right, John (eagle); lower left, Luke (ox). Il Commento all'Apocalisse di Beatus di Liebana, copia catalana (secolo XI-XII) del Beatus visigotico della cattedrale di Gerona, databile al 975. The Commentary on the Apocalypse of Beatus of Liebana, Catalan copy (XI-XII century) of the Visigothic Beatus of the cathedral of Gerona, dating back to 975. Beatus Liebanensis, Commentarius in Apocalypsim, et alia (lat. ), ms.J.II.1, Ms. membranaceo, sec. XI-XII.